Prez Jim doing his best Grant Gerke and John Kerekanich impersonations for the Auction. It’s a month to the auction so be sure and get your procurements in. 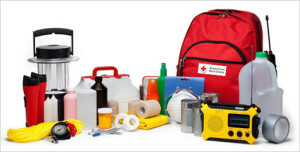 You can bring to club or drop off at Newberg Ford. Denise Bacon shared the items she’d gotten as did Jim McMaster and Paul Jellum. Bring your items next week to get a mention. You can sign them in online, or we’ve got the receipt forms at the meeting. We have 128 auction items, but we need more! We’ve sold 45 Golden Tickets, but 25 of those are to John Kerekanich so the rest of us need to get our tickets or sell them. You can’t hardly beat the odds of 1 in a 100 chance of winning your choice of the live auction items. You can buy Golden Tickets, Dinner Tickets or register your items for the auction online at newbergrotary.org. Jack Czarnecki was joined by his grandson Evan from Kansas who has the unique talent of knowing the jersey numbers of every ML Soccer player! We got a shout out during the Duck for GFU Women’s Sports who are doing fantastic this year with national rankings. The guys aren’t doing too bad either. Think about serving Rotary next year on a committee or as a chair. Talk to Leah. The 80th anniversary video done by Melody McMaster, was shared with the club and it brought up lots of discussion about activities and projects for next year. Leah Griffith shared that we are looking for a treasurer, membership chair and club service chair and of course PR and the newsletter. Talk to Leah if you are interested. 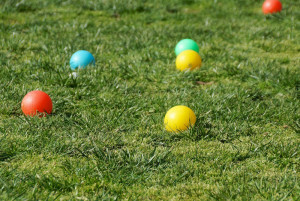 Jack Cz arnecki shared that one of the wineries is setting up a bocce ball league and we could have a Rotary Team. We also talked about some no-host pizza and beer nights and other times to just connect with each other. This coming year we’ll be working on the Christmas Tree Lighting event and in May, watch for our service project to clean up Memorial Park before the Memorial Day activities. Paula Radich, secretary, is going to start sending out a report of the Board meeting each month. 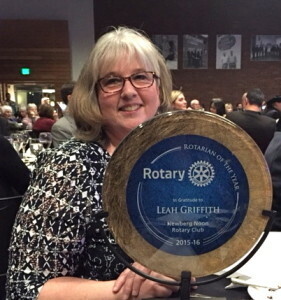 Friday Night was the Chehalem Valley Chamber of Commerce Awards Banquet which included Noon Rotary’s announcement of the Rotarian of the Year, Leah Griffith. I am very humbled to have been presented with that award. Thank you. 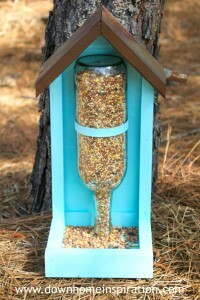 Extras for this week: I saw these wine bottle bird feeders and had to share. 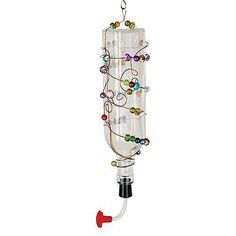 I bet if someone could make a couple of these, they would sell at the auction! 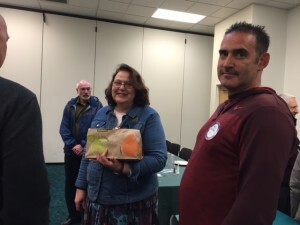 The Chamber is working with a kickstarter project that can bring innovation to local business startups in Newberg. 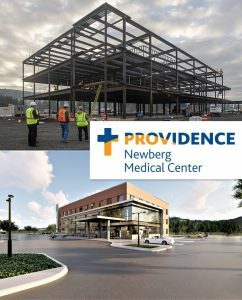 We need 100 locals to give at least $1 to bring the project to Newberg. Here’s the link to the Chamber page that will tell you more about it. I gave my $1. 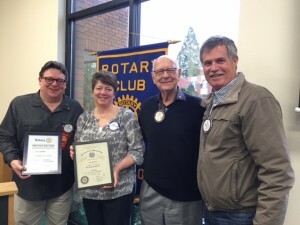 We had a number of guests this week; Visiting Rotarians Al Jubitz, Past District Governor Deniel Banks and Deniel’s husband Warren Banks, all from Portland area clubs. Amy Caruso, wife of our own Mike Caruso joined us as well. 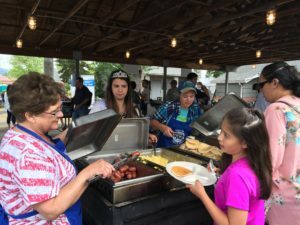 Brian Casey, Newberg-Dundee Police Chief was the guest of Denise Bacon, David LeBoss, son and guest of Laura Tilrico and Andy Becker, guest of Geoff Gilmore filled out our guest list for the day. Jim McMaster was back from Guatemala along with Allen Methven. Auggie and Grant Austin will be back later. Jim related what a fantastic opportunity it was to experience another culture and he also brought his wife and son along who also gained a lot from the service trip. We’ll be hearing more about Guatemala at a program later this spring. It was a great day in that we inducted Dale Welcome to our club. 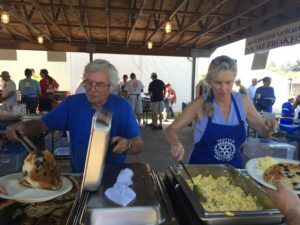 Dale works with World Vision and his work is focused on children and helping them around the world, a pretty close connection to Rotary’s mission as well. Dale was sponsored by his father-in-law Stan Kern and his wife Joy Welcome joined us for his induction. It’s great to have Dale in the club. 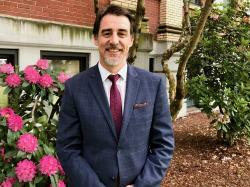 We announced that Scott Karn will be club vice president next year. This puts him in the line up for president in 2018-19 after Leah Griffith in 2016-17, Todd Engle 2017-18 and then Scott. 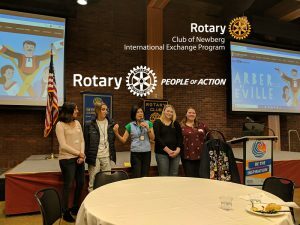 We were fortunate to have Natasha Haunsperger, Rotary Peace Fellow and Portland Police Bureau officer, share her experiences as a Rotary Peace Fellow (www.rotarychula.org) and how she has taken that training and used it in her work with the Portland Police Bureau. She has her heart in serving the immigrant/refugee community. She used the knowledge and experience she gained to present a program to the Chief’s and Mayor’s office in working with refugee youth. It is a serious problem with refugee young men joining gangs. It isn’t that they want to join the gangs, but after living their whole lives in refugee camps, no education, and lack of strong parental support (many are single parent households with mothers trying to care for 7-8 siblings), and a gang becomes family. 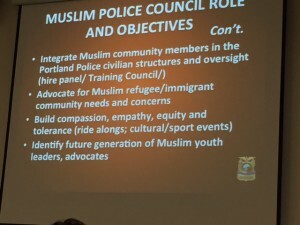 She was able to restart the American Muslim Police Council which reaches out to the immigrant community, especially with the youth to provide them with guidance and the opportunity to see the police as helpful, not the authoritarian armed guards of their youth in refugee camps. She’s used her contacts with her class of peace fellows around the world to discuss issues and ideas on how to make this outreach program successful. 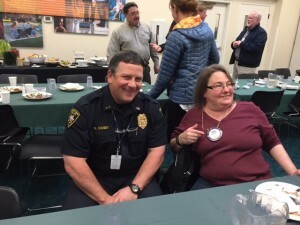 Natasha first learned of the Rotary Peace Fellowship when a group of Rotarians including PDG Banks and Al Jubitz, came to the Police Bureau to share the opportunity of the Fellowship program. Natasha and another officer both applied and have attended the program. 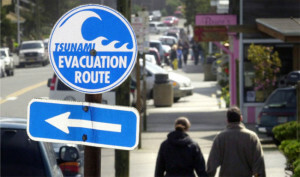 This is an outstanding program and the concepts of peace are as valid at the local level as at the international level. 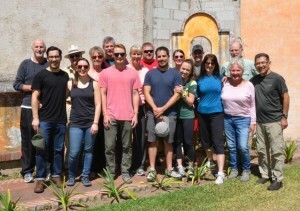 Rotarians Jim McMaster, Auggie Gonzalez, Grant Austin, and Allen Methven attended Rotary in Guatemala this week. We’ll be hearing more about the 15th year of this effort in Antiqua and other nearby villages in a program later this spring. 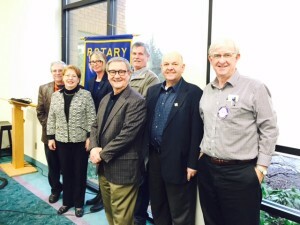 Good job Rotarians. Since Prez Jim was down south, I had the pleasure of running the meeting. We had a number of guests this week. Walter Want introduced Terry Carroll, a fellow pilot during their time together in Vietnam. Terry confirmed that Walter’s stories are all true! 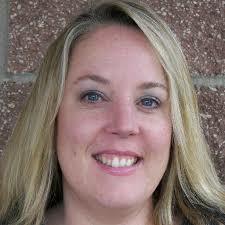 Katy Tatro was a guest of Om Sukheenai and Brenna Hamilton was Dawn McClard’s guest. Laura Tilrico was pleased to introduce her son David from Kissimmee, Florida who came up not only to visit, but to help Laura and Mike with some farm work. Forrest Arriaga joined us as he is interested in Rotary and contacted us through the web site. 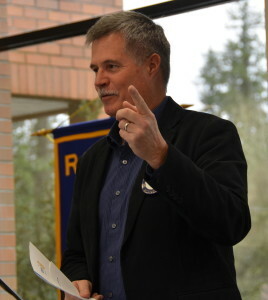 Geoff Gilmore invited members to his seminar on Innovation that he is holding next Wednesday (after club), March 9th, at 1:30 at the Newberg Library. This is a new seminar Geoff has developed that he is presenting to clients and is wanting to try it out on a group of business people. We had the pleasure of re-inducting Nicole McIntyre to our club. 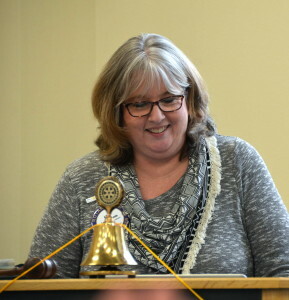 Nicole first joined Newberg Rotary in 2003 and immediately became an active member serving as president in 2009-10 and chairing the auction in 2006. 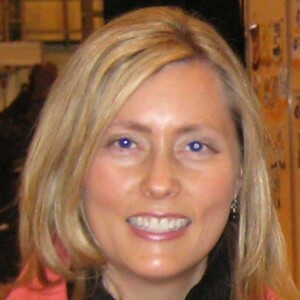 She was selected as Rotarian of the Year in 2006 for her leadership with the auction. Nicole is Vice-President and Business Banking Manager for First Federal and we’re fortunate that her work allows her to set her schedule to be in Newberg on Wednesdays. Jan Winder served as Nicole’s sponsor and returned Nicole’s badge to her to wear once again. 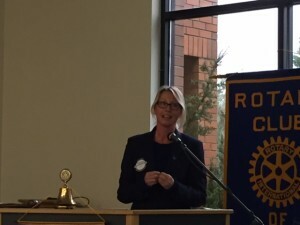 Nicole also received the new style Rotary logo pin, the first in the club to receive it. Welcome back Nicole.